Wabasha County, located a little more than an hour south of the Twin Cities, is one of the few large dairy counties left in the state of Minnesota. And until 2015, they were the only one of those few counties that didn’t have an advocacy night. That’s why, in 2015, Katie Brown, a local field staff representative for Land O’Lakes, decided to motivate Wabasha county farmers to host a Family Night on the Farm, an event where locals could bring their kids and grandkids to learn about agriculture, farmers in their area and get a hands-on look at life on the farm. This year she partnered with Land O’Lakes member-owners to help tell the story of modern farming. 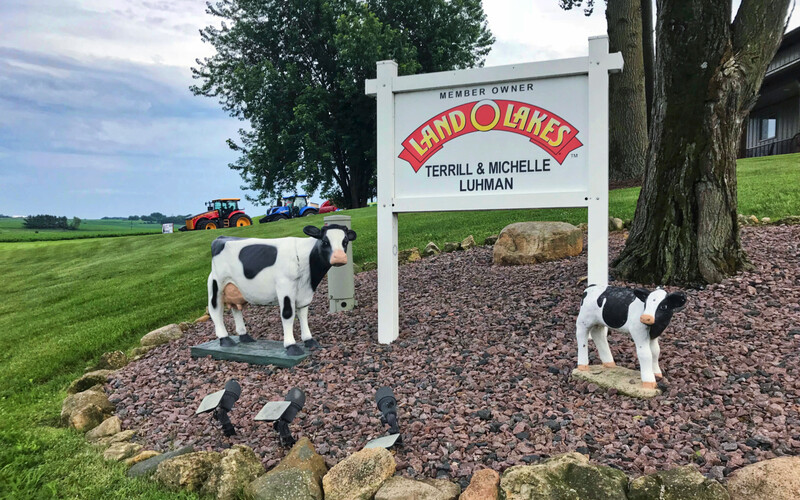 “I’ve always tried to promote agriculture,” says Terrill Luhman, Land O’Lakes member-owner. That’s why he and his wife, Michelle, decided to be the hosts for the 2018 event. Hundreds gathered on the Luhman’s beautiful dairy farm outside of Zumbro Falls, Minnesota for education, food and fun. The event had activities such as a milking parlor tour, farm animal petting area, learning booths, local ag history display and an ag cab lab. “It’s great for people who don’t know what happens on a farm or what goes into what they eat and drink,” Terrill says. But Terrill doesn’t see this exclusively as a family event, highlighting that it’s a place where farmers can gather together to socialize. “We can talk about hurdles we’re facing and how things are going,” he says. Considering everything that goes into life on the farm, it may seem impossible to try and host an event like this amidst all the other work that needs to be done. Terrill had felt that way once too but changed his mind when he thought about the big picture of all the positive influence the event could have on the community. A farmer is no stranger to hard work, planning and dealing with the elements, and preparation for a Family Night on the Farm can pose the same struggles. But a farmer is also no stranger to the satisfaction of a job well done, and the success of a Family Night on the Farm can be just as rewarding. Terrill and his wife Michelle can attest to that.